1. You’re born genetically susceptible to some sort of allergic condition. 2. Exposure to even a small amount of the food sensitizes your immune system to the food. Your immune system produces antibodies to attack the food next time it enters your system. Upon your first exposure, you may not experience symptoms; your immune system is just gearing up for next time. 3. You consume the problem food again, and your immune system, now sensitized to the allergen, leaps into action to purge the allergen from your system. 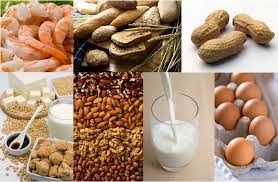 Food allergies typically show themselves in the first few months or years of life; and food allergy sufferers often outgrow their allergies by the time they’re teenagers. Some food allergies, however, such as allergies to fish and shellfish appear later in life and rarely disappear over time.